Firebrand’s expert instructor, Dave Petts, was recently acknowledged as among the top 25% of Cisco instructor’s in the world. Upon winning the Cisco Instructor Excellence Award, Dave was recognised for providing the highest quality of Cisco training for Firebrand. This marks the fifth time Dave has received the award. 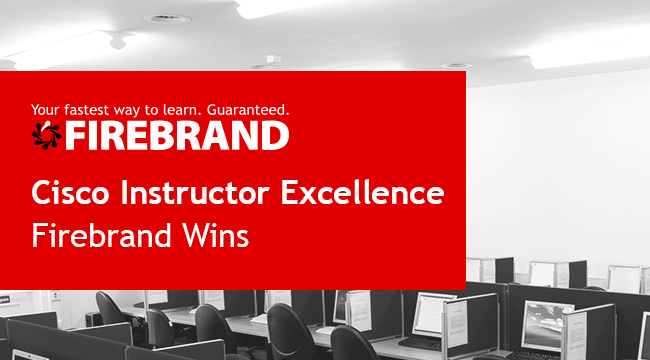 What is the Cisco Instructor Excellence Award? The Cisco Instructor Excellence Award recognises Certified Cisco Systems Instructors (CCSIs) that demonstrate the top overall performance and student satisfaction, as measured through regular customer surveys taken in 2016. As an expert Firebrand instructor, Dave holds 30 certifications and is certified to teach 29 different courses across Cisco technologies and more – including accelerated CCNA and CCNP Routing and Switching courses. “It’s great to be recognised by a major vendor like Cisco. This award validates the commitment that Firebrand Training shows for producing quality and immersive training for their students. Firebrand is an official provider of accelerated Cisco training, including CCNA Cloud, CCNA Routing and Switching, CCNA Security, CCNP Routing and Switching and more. Since launching in 2001, Firebrand has trained over 65,000 students across the globe with the help of our dedicated and committed instructors.